Colorado Peak Politics | SPECIAL REPORT: Is Tipton’s GOP Opponent Really a Democrat? SPECIAL REPORT: Is Tipton’s GOP Opponent Really a Democrat? Alex Beinstein, a 28 year old Carbondale resident, is vying to unseat Scott Tipton as Colorado’s District 3 GOP congressional candidate. In his blog, Beinstein says he’s running because he wants “to annihilate Islamic terror” and restore Americas Constitutional heritage. These goals are both ambitious, and a little incongruous for a guy who just six months ago registered as a Republican for the first time. According to Beinstein’s Colorado Voter ID data, he first registered as a Republican last September, just a few months before throwing his hat in for the congressional run against Tipton. Although his voter record does not indicate previous affiliation, it appears that Beinstein’s parents, Jerry and Leslie Beinstein, are life­long Democrats. The young candidate’s voter record also indicates he still lives with them in Carbondale. 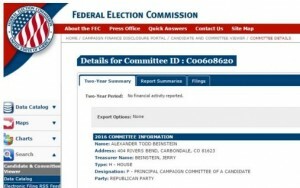 Although campaign finance law does not require disclosure of campaign workers’ party affiliation, Democrat Jerry Beinstein is listed as the treasurer for his son’s campaign. Beinstein, who claims he is politically “further to the right” than Congressman Tipton, grew up in the Roaring Fork Valley and attended the University of Chicago as an undergrad student. There, he produced a radio show for WHPK titled “Tomorrow with Alex Beinstein.” He began doing interviews for his show in 2006, and interviewed several powerhouse politicos including David Plouffe (Obama campaign manager), Austan Goolsbee (Clinton political strategist), and Ambassador John Bolton. Although Beinstein’s political goals are lofty and resonate with many conservatives, on the Western Slope, his family affiliations are likely to be a subject of intense scrutiny. Whatever. Everyone expects Tipton to win in a landslide. Majorie, guilt by association is not guilt. Still doing incumbent protection? Then dump him. we have had too many infiltrations and rinos get elected! Dump him!